For people who have completed our 2 hour “Ready to Ride” session, we can offer more challenging sessions where we’ll spend a half or full day paddling along the river, taking in some beautiful countryside and enjoying a relaxed and fun trip together. These trips will either be on the Thames, or the Cherwell, or for groups ready to take on something different we can arrange trips on other rivers across the UK including the Avon, The Wye and the Severn. Trips outside of Oxfordshire can be arranged to include transport to and from the trip destination. 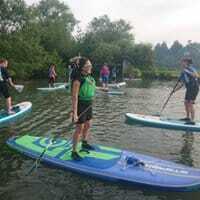 These trips are aimed at people who have mastered the basics of SUP, either in one of our lessons or at another SUP School, and want to tackle a longer trip. If you have not passed a “Ready To Ride” lesson, or something similar, you will need to attend a training session with us so that we can assess your ability to complete the trip.